FNB Wines2Whales Adventure riders said farewell to Oak Valley Wine Estate today, which has been their home for the past two days. The third stage consisted a 73km route that took the total number of kilometers traveled to 213km. Michael Creedon and Andrew Davies of Team Oakhaven-Granite, the second team over the finish line, claimed the overall men’s category title in a total time of 10 hours, 57 minutes, and 27 seconds. “We had a big ride on stage two, so we expected today’s stage to be a bit more difficult. The rugby players are strong and showed their wisdom and international sporting experience,” said Davies. Joel Stransky and Jeremy Thomson of Team Rugby Celeb Team 2 took the second place followed by Anton Koller and Gregor Krall of Team Rehidrat Sport in third. Theresa Ralph and Michael Petersen of Team RBS claimed a hat trick stage victory, taking the overall title in a time of 11 hours, 57 minutes, and 3 seconds. “Today’s stage was deceiving,” said Ralph. 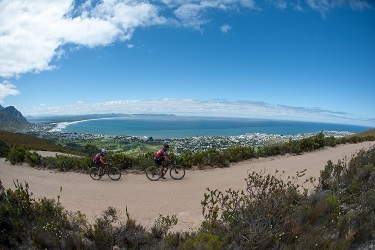 Neill Ungerer and Thea-Mari Van Der Sandt of Team Scott 2 Lovit claimed the second place while Coenie Thomas and Leorine De Wet of Team Operation Smile SA finished third.